FilmWorks Entertainment announced this past week that makeup and F/X whiz Harvey Lowry’s trip behind the camera as director, Cassidy Way, will be making its DVD debut on Feb. 23. 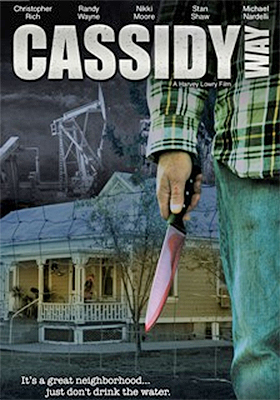 Based loosely on actual events, Donald Connors (Christopher Rich), his wife, Mary (Lisa Long) and their two surviving children — Kelsey (Sydney Sweeney) and Jamison (Sean H. Scully) — are still grieving the loss of Ferris, their young son and brother, who was killed by security guards when he was caught trespassing on a Saxlow Industries’ fracking project. That was nearly ten years ago, but for the Connors it was like yesterday. Time for them has stood still. The locals know not to drink the water, but Donald has ignored that advice of late and has been guzzling down the tainted water as if it were a fine wine. The result, he’s starting to lose it — grief and insanity can be a deadly combination. Mary, his wife (a dysfunctional pill-popper) and her kids have issues of their own — anger and a thirst for revenge can be a combination that is just as deadly. It’s like an itch that can’t be scratched. Meanwhile, in something of a parallel story, we are introduced to Gina (Nikki Moore — Kiss the Abyss, Sorority Row, The Babymakers, etc. ), a college student working on her filmmaking thesis project, which just happens to be a documentary on fracking and the resulting tainted water supply. 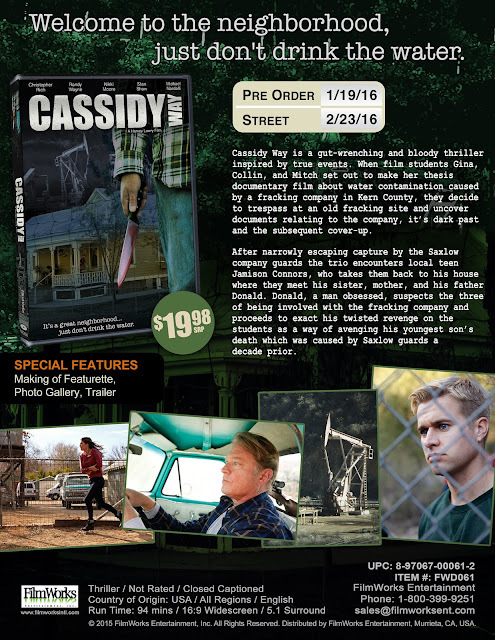 Her filmmaking crew — which for any good horror thriller also doubles as the “victim pool” — includes Collin (Randy Wayne) and Mitch (Michael Nardelli), both of which are enamored with the lovely Gina and more than eager to go anywhere she wants to go. Their worlds collide when Gina and her friends begin nosing around the area in an effort to build their film story. Donald, being more than a little unhinged comes to believe that Gina and her crew are with Saxlow — which is very bad news for them. The Connors have descended into madness, but not without good reasons as executives (a nice turn by veteran Stan Shaw) from Saxlow Industries are after their land and violence is not beyond them. That fuse lit so many years ago has continued to burn … there’s simply no reasoning with insanity! Cassidy Way is a slick, well-produced (owing immensely to Lowry’s years of industry experience) thriller that will keep you on the edge of your seat. It’s not a horror film in the traditional sense, but a psycho-driven suspense thriller with horrific elements (torture, murder, madness and packed with some pretty grisly elements). Bonus goodies include a photo gallery and a Making-Of featurette.